Studies have long suggested that divorce and single-parenting may have negative effects on children. Children in these homes tend to perform worse in school, exhibit more behavioral problems, and are more likely to have social and relationship issues as they get older. But even in homes where parents are married, parents should be aware of how their relationship is affecting their children. Children are expert imitators, and a couple’s relationship is often mirrored in the actions of their children. 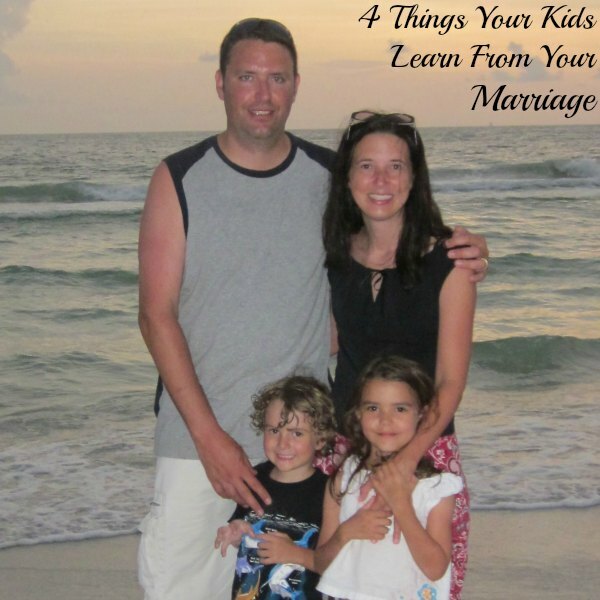 Here are four aspects of your marriage that may be affecting your children. Whenever my dad kisses my mom in front of us kids, she smiles…and then gets embarrassed and tells him to stop. Once she commented that she doesn’t kiss our dad in front of us because we don’t like it. I (and I suspect my siblings too) wanted to yell, “No, we want you to kiss!” Ok, we don’t want to see them make out or anything (gross) and, yes, we definitely look away (and probably made disgusted noises when we were younger). We don’t actually want to see them kiss, but we want to know that it happens. Affection between parents gives kids a sense of security. If mom and dad are doing well, it feels like everything will be ok. Closeness between spouses leads to closeness within the family. Children learn about relationships by watching their parents; those who see their parents showing their love and being openly affectionate with each other are more likely to be open in their current and future relationships. And remember, children don’t see what happens behind closed doors; avoiding affection in front of them may send the wrong message that you and your spouse aren’t very close. Conflict occurs in even the strongest marriage, and it can actually be healthy for kids to see you and your spouse work through your differences. Avoiding any sort of argument in front of children can lead them to think that a strong relationship is an argument-free one and hurts their ability to work through problems in their future relationships. When you and your spouse do have something to work out, do so in a positive, constructive way. Patiently and kindly tell your spouse that you feel he is spending too much time working in his dental office, and actively listen when he expresses frustration that your friend Brenna calls you almost every evening. Name calling, verbal or physical abuse, sarcasm, and talking behind each other’s backs will teach children that these are acceptable behaviors while at the same time making them feel anxious. Children also notice silence and lack of interaction between parents. Children who are worried about their parents’ relationship rarely vocalize their feelings and instead tend to misplace their anxiety and act out. Performing poorly in school, talking back, or becoming disinterested in friends or activities may be signs of a child’s anxiety about discord between parents. If you and your spouse are fighting, seek a healthy way to work out your differences. Be open with your children and reassure them that parents sometimes disagree, but they still love each other. Being a team means putting your spouse before your kids and being unified on rules, routines, and expectations. It may sound cruel to put anyone before your kids, but studies have shown that couples who put their kids before each other not only hurt their marital relationship but also their relationship with their kids. When kids come before spouses the kids tend to be needier and less secure. When mom and dad are a team, kids feel safe and grounded because they can expect consistency. There is no “But Dad said I could” or “Mom told me I didn’t have to.” Part of building a marital team is not making mom the constant bad cop because she is with the kids all day or making dad the less-authoritative figure because he is away at work. It’s ok (in fact, it’s important) to have date nights and explain to your kids that you want some time for just the two of you. Parents who do so report that their kids become less demanding and whiny and are better able to entertain themselves. And date nights allow parents to maintain the romantic aspect of their relationship. I am fortunate to have loving parents who have always had a strong marriage. However, my parents are very independent people who, though they love each other, tend to spend more time apart than together and often parent separately. Though unwitting and unintentional, their lack of team model has affected the culture of our home. Though you may feel your marriage is strong, pay attention to the model that you could be presenting to your children. Most homes run more smoothly and efficiently when family members are assigned specific tasks. However, family members sometimes get into a habit of labeling certain activities as “his job” or “her job,” creating divisions or leading to resentment when others don’t help out. If you feel that your children are struggling in some way, first reflect on your relationship with your spouse. Children see much more than we sometimes realize, and their behavior may be a reflection of the strength of your marriage. Communicating with your spouse frequently about these four aspects of your marriage will help you to build a strong, healthy marriage and home.